Lately, I've been doing small projects, using up little bits of leftover yarn . Specifically, I made a set of baby wash cloths (or warsh rags as I can't seem to resist typing). Some are pictured above, some are pictured below. In all, I made six, based on the squares of the Louisa Harding cot blanket that I call Neverwhere after the somewhat gross Neil Gaiman novel. As in Neverwhere, I added the cat and flower of my own design to the heart and star designs proposed by Ms Harding. I used the established 37 stitch/49 row format with the moss stitch edging, but I used worsted instead of dk weight yarn and #7 needles instead of #5. 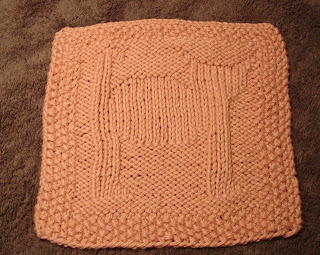 The resulting squares turned out to be 7" square instead of 6.5 x 6.75" as in the Neverwhere version. I like this size better for wash cloths and maybe better for a blanket due to the squareness. One square turned out a tad bigger. That was the brown one made from the stray ball of Knit Picks Main Line that I test knit a few weeks ago. This is a thicker worsted weight yarn, perhaps too bulky for a baby cloth. This little project turned out to be a good exercise in the further testing of yarn. The Knit Picks Comfy (pink) that I swatched along with Main Line worked up very soft and comfy-feeling, but it didn't block well as the photo above shows. Too much acrylic (25%) in the mix? I don't know. It reminds me of Lion Brand Wool Ease in this regard. It would work better if the squares were sewn together. I love the color though. The yarn that really surprised me was Cascade Pima Silk (ivory). I had made a sweater from it at a gauge of 4.5 stitches to the inch (the recommended gauge), and really disliked the fabric: not enough body and too bumpy and uneven. On this exercise however, I got 5 stitches to the inch. What a striking difference! The fabric is smooth, firm, but not too, and silky. I can't wait to try it again. We must be on parallel tracks. Your beautiful blanket inspired me to cast on with some Manos Stria I had stashed for no specific purpose. The Manos is unplyed and doesn't show the seed st. motifs clearly enough so I am experimenting with simpler play on texture with squares that will become a blanket. Your wash cloths (definitely not raglike) are a lovely idea. I like your little projects - sort of like "knitting tapas"! They are great inspiration for getting back my knitting enthusiasm.